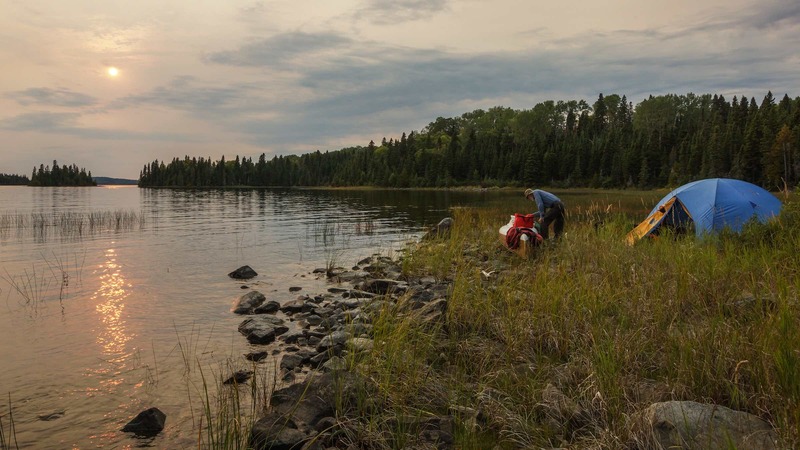 Why go paddling on Lake Nipigon? 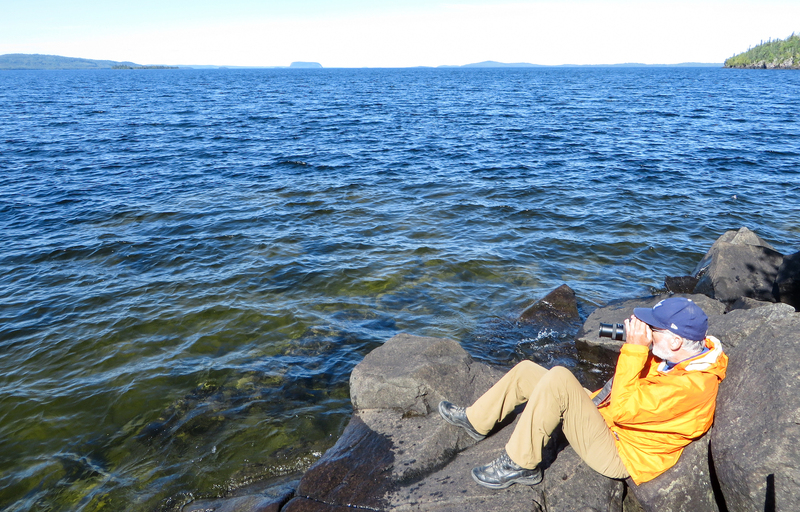 This post will focus on the time we spent island-hopping the northwest corner of Lake Nipigon. 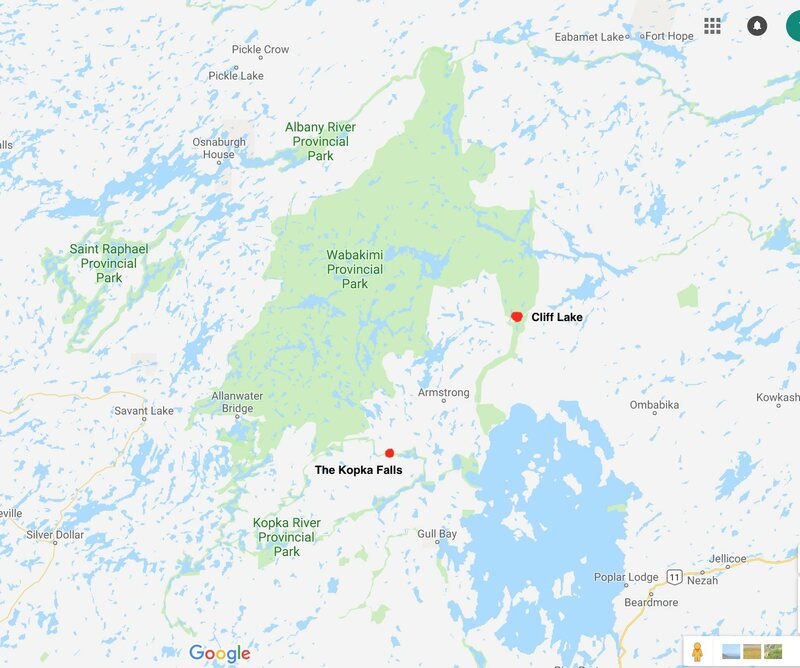 The reason for doing this was so we could connect our two favourite Wabakimi-area spots – the pictograph sites on Cliff Lake and the dramatic gorge section on the Kopka River. 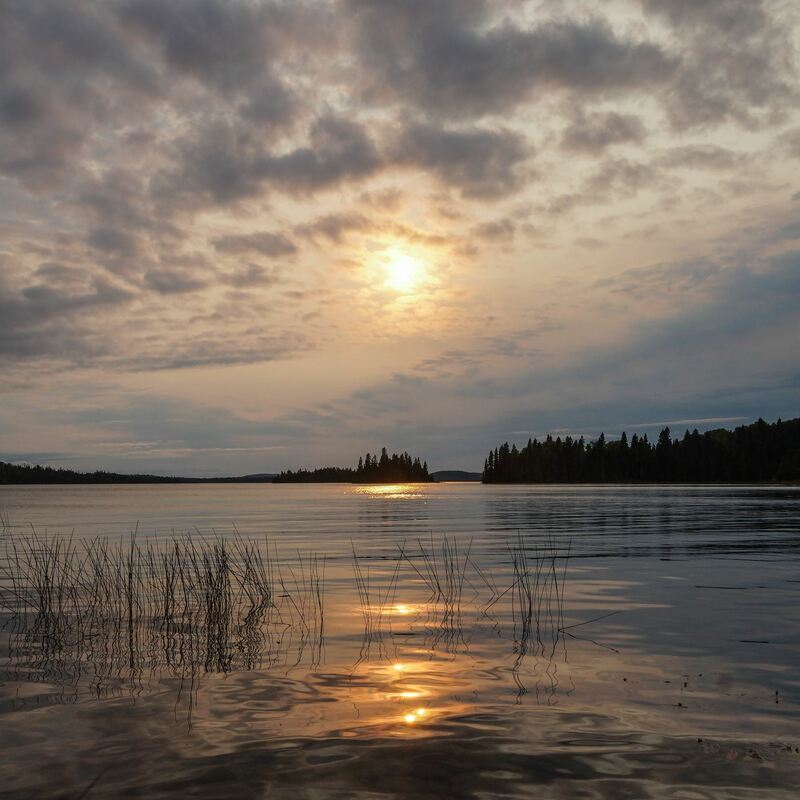 [ See A Paddler’s List Of Wabakimi’s Top Six for our other top spot choices!] In the end, we never did go up the Kopka, choosing instead to exit via Waweig Lake off Highway 527. We did, however, finally get to paddle alongside Echo Rock! 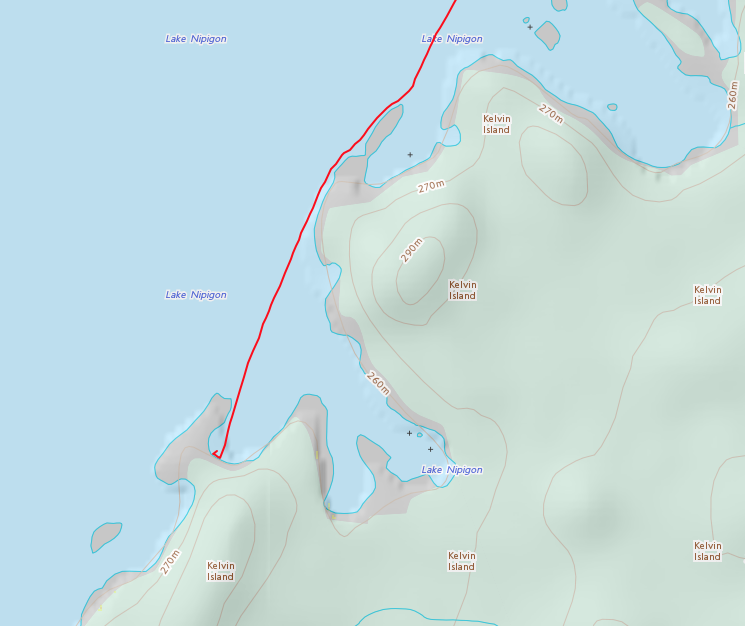 While venturing out into Lake Nipigon in an open canoe is not something to be taken lightly, our route did make use of the string of islands that stretches from Meeting Point at the south end of Windigo Bay all the way down to Kelvin Island. 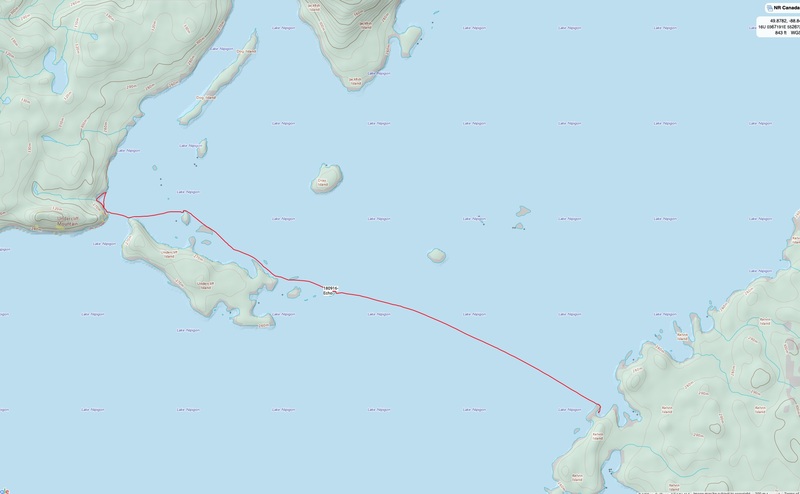 The two open stretches of about five km. 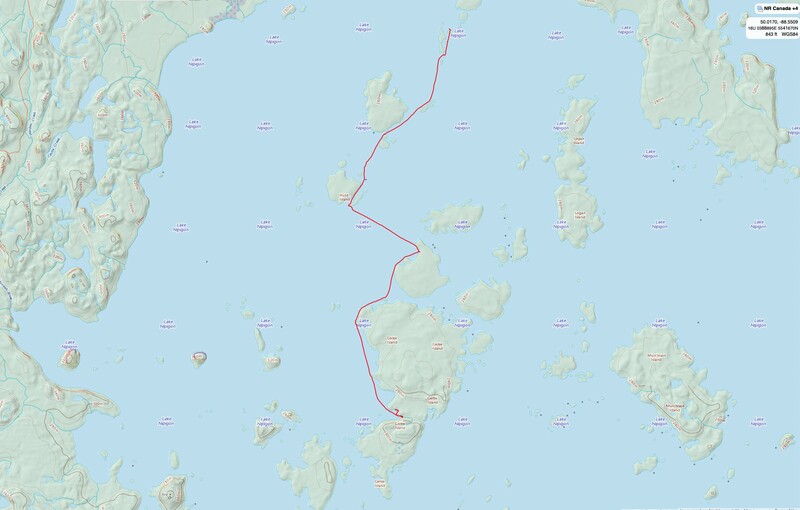 each (from Hunt to Billings and from Kelvin to Undercliff) represented the biggest objective dangers; we spent the other 85% of the time paddling along the shore of one island after another. 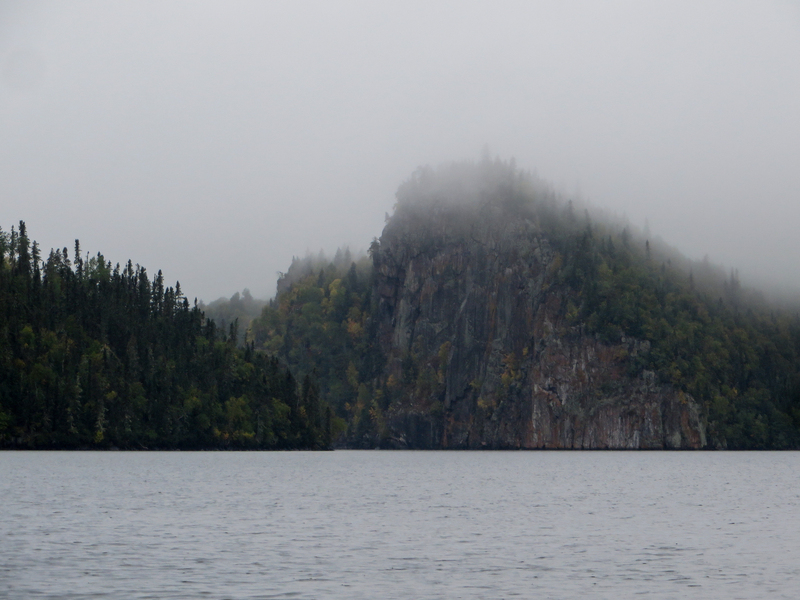 Of all of the paddling options on Lake Nipigon, ours was one of the least exposed. 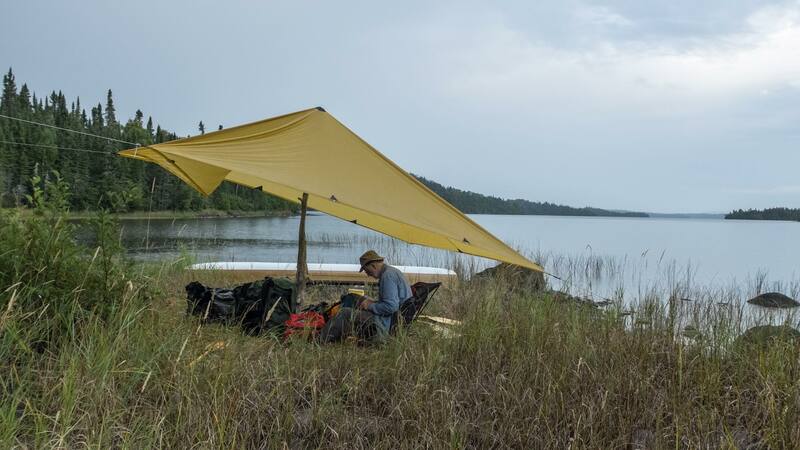 One of Phil Cotton’s last pieces of planning advice was for us set aside up to a few days just in case we ended up getting wind-bound on a lake that seems to create its own weather system – with winds coming from all directions of the compass on any given day! Ironically, it would only be when we got to the west shore of the big lake at Echo Rock that we had to take a wind day! At the end of the trip as we stood at the Mattice Lake Outfitters desk and settled our bill, I mentioned that our Lake Nipigon crossing had me wondering once or twice if we were nuts to be doing it. Someone behind the counter said – “We wondered the same thing!” So – unless you have made a special arrangement with the weather gods, are paddlers experienced enough to know when to go and when to settle in for a wind day – make sure you understand what you’re signing up for! 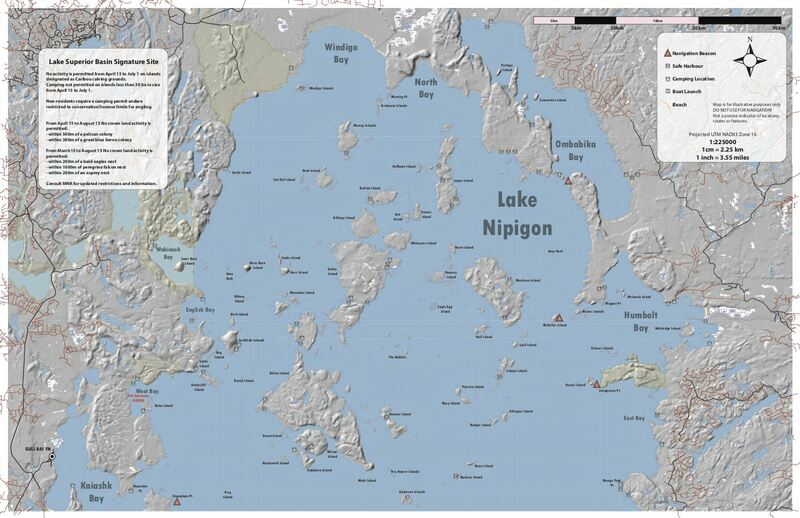 The other source was the north half of the Lake Nipigon Signature Site Map from 2016. 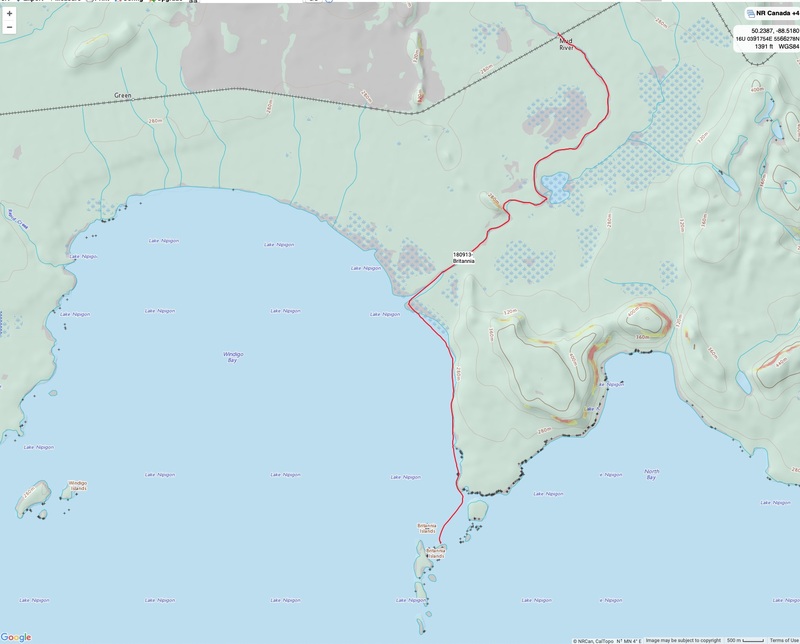 It is no longer in production but the map’s creator, Glenn Hart of Nipigon, has an updated 2019 version available for digital download. Click here for information. 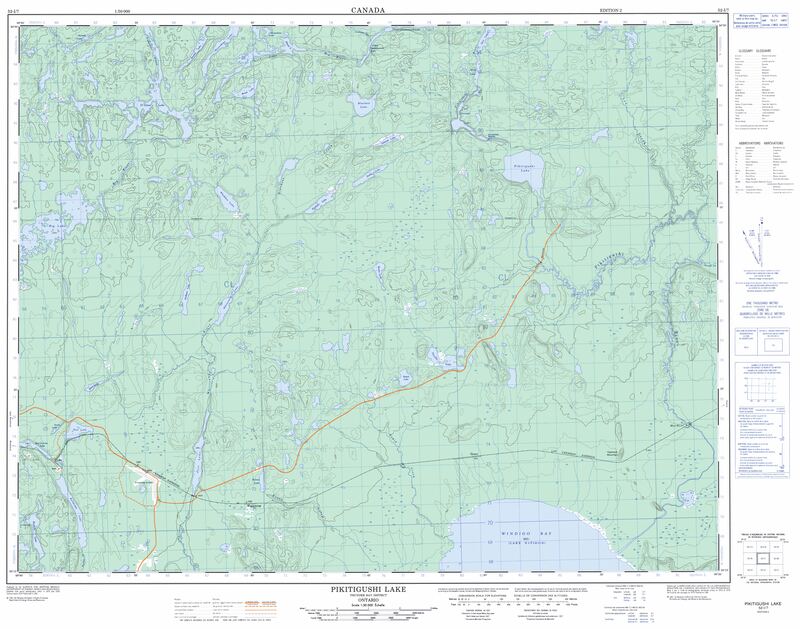 Hard copies of the map set are also available at Hart’s Bait Tackle and souvenir shop in Nipigon. Also, the maps have been ported to GPS Enabled Smartphone maps (to go live in early 2019. We made use of campsites mentioned in the trip report and indicated on the Lake Nipigon Basin Signature Site Map. From the garbage found at two of the ones we stayed at, they are used very occasionally by fishermen in motorboats. 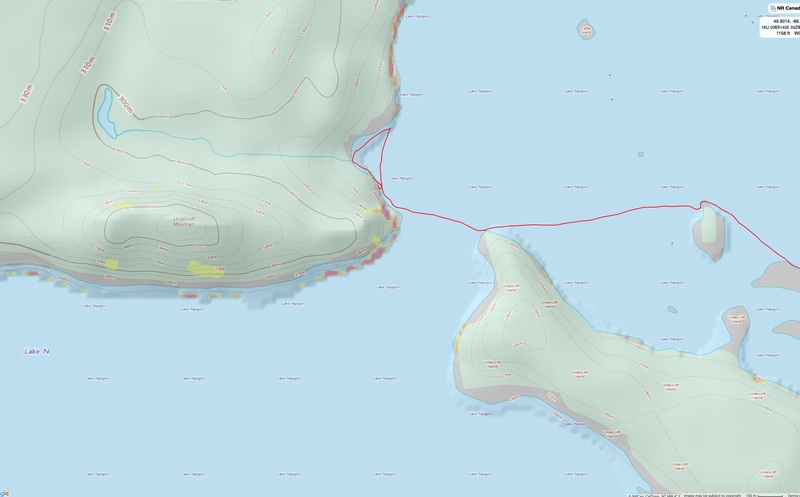 A useful extra bit of information on the map is the location of beaches which are indicated in yellow. 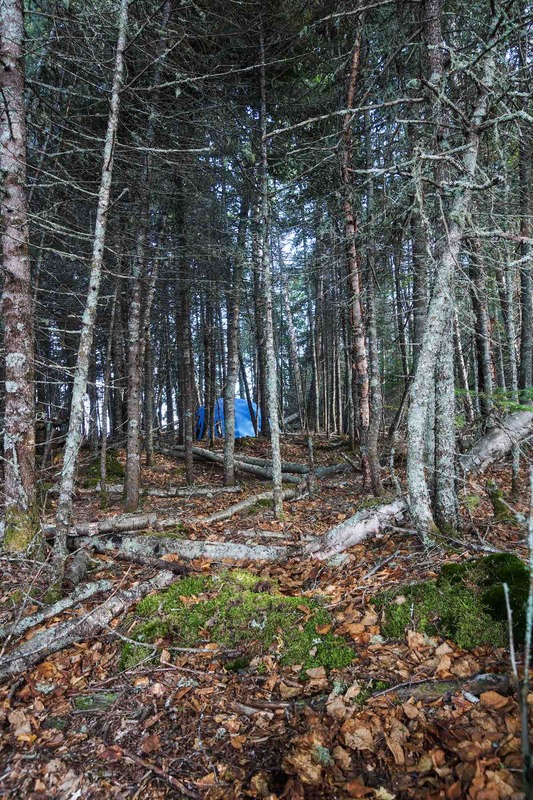 In a pinch, emergency campsites can be made on or above most of those beaches. 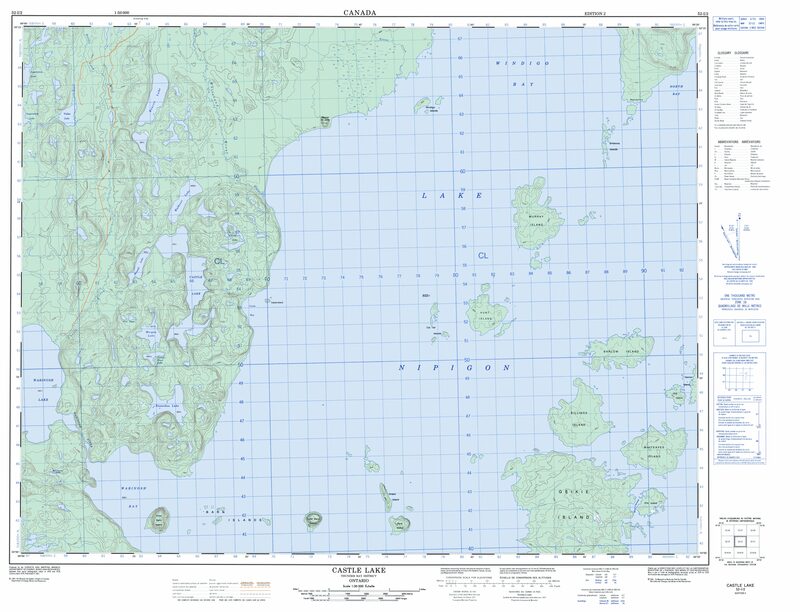 You can access the Government of Canada’s NRC server here if you want to download the maps in tif format. Just go to the 052 folder to get started. 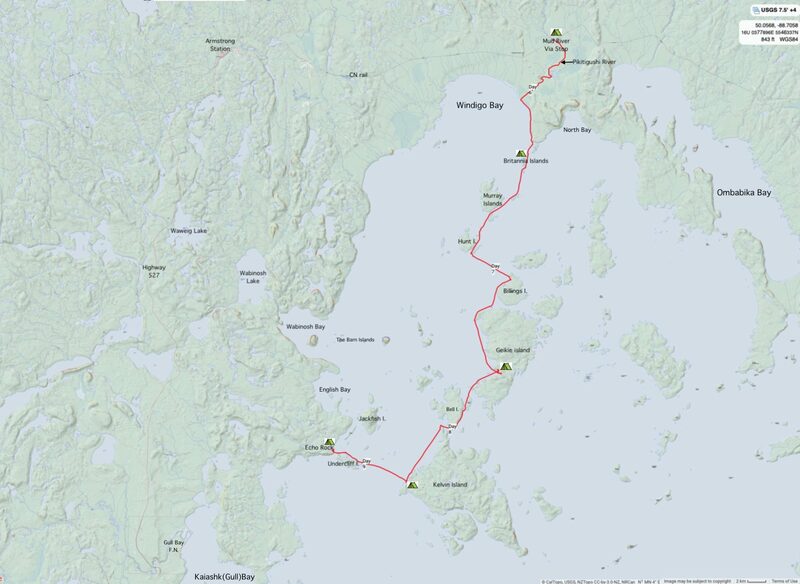 The GPX track for the route of our ten-day trip from Cliff Lake to Waweig Lake can be accessed in my Dropbox folder – 2018_Pikitigushi_Nipigon_Wabinosh Tracks. Day 6 – From Mud River VIA Stop to The Britannia Is. time: 9:15 a.m to 12:40 p.m.
Our previous post –Canoeing The Pikitigushi From The Bear Camp To Windigo Bay – has some info on the stretch from the CN rail bridge at the VIA Mud River stop down to Windigo Bay. We paddled down the east side of Windigo Bay past Meeting Point. The Bay is characterized by shallow water and sometimes we dipped in no more than half a paddle. 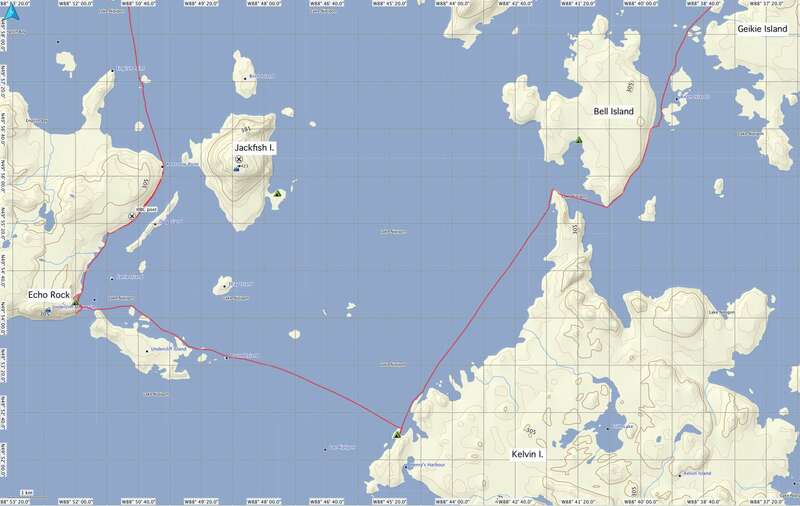 There was a bit of a breeze from the south which would pick up as we approached the Britannia Islands group. Given that we had already done 17 km, we felt okay in calling it a day shortly after noon. The fact that the sun was out meant we could relax and dry things out once we set up camp. 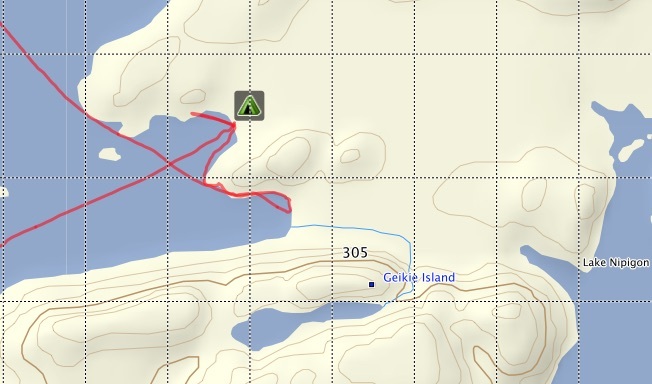 We had a Britannia Islands campsite location marked down on our map, thanks to that Lake Nipigon Kayaking Trip Report (click on the title to access) posted by Bryan Hansel on the Paddling Light website. The two kayakers – Hannah Fanney & Rodney Claiborne – did a clockwise trip around the lake from Sept. 12 – Oct. 2, 2017. 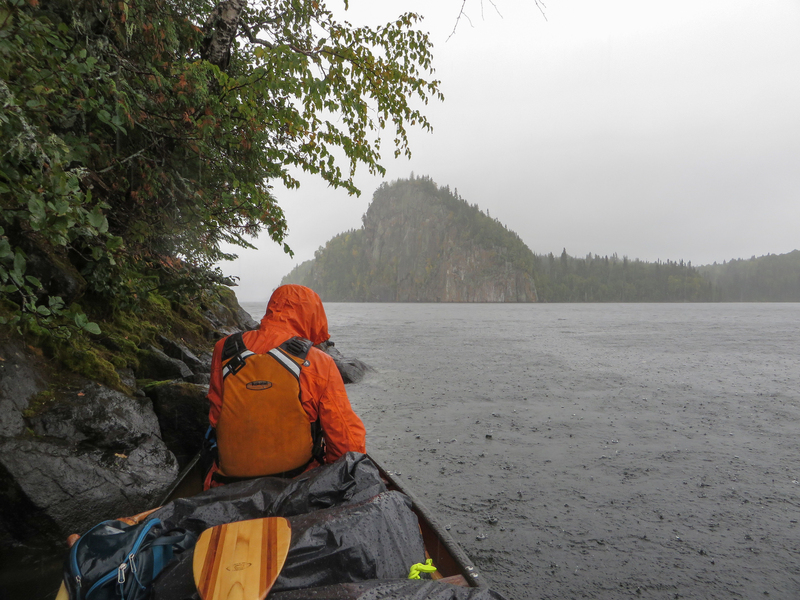 Given the weather they had – 15 rain days out of 20 – their three-week adventure would deserve a Survivor: Lake Nipigon series! 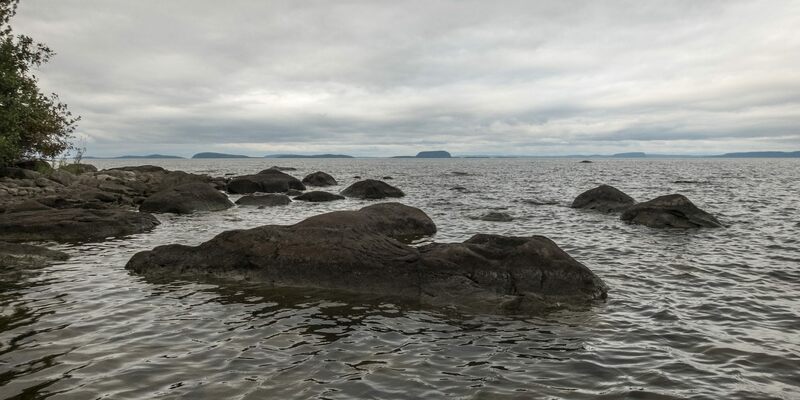 Google for information on Lake Nipigon paddling and their report is about the best – and the only – thing that will appear. We were happy to find something so recent and made use of it for our brief passage on the northwest section of their route. 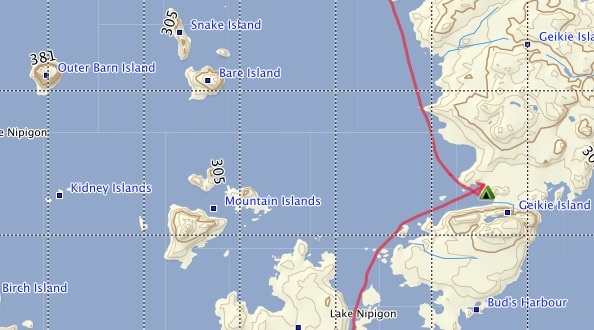 We did not end up using their Britannia Islands site! 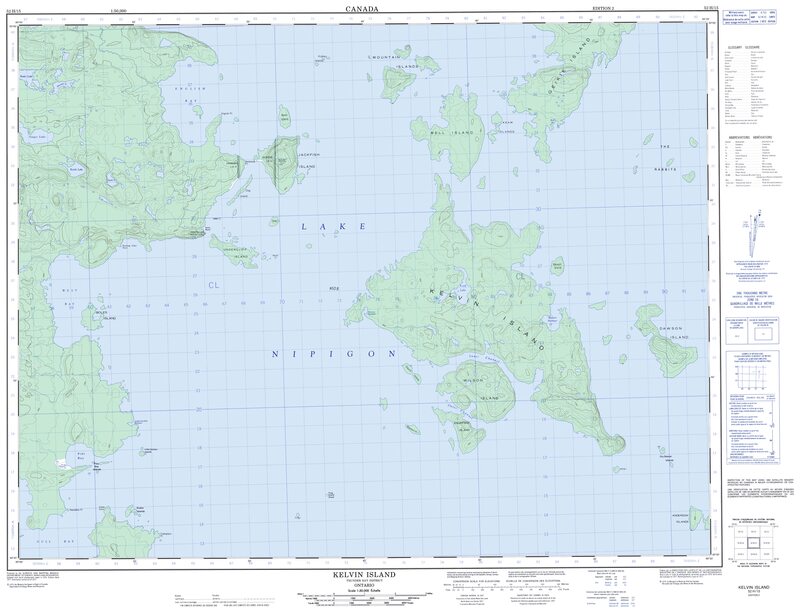 Their site was marked on the south side of the easternmost of the islands that make up the Britannias. While we landed on the same island, we ended up in a small bay on the island’s north side with ample room to spread things out to dry. We looked over Windigo Bay and towards Haystack Mountain on the mainland, about eleven km. from our island campsite. The pyramid-shaped hill would have been a useful landmark for Ojibwe shamans or vision questers two or three hundred years ago leaving their summertime settlements on the west side of the lake and heading for the mouth of the Pikitigushi on their way to the lake we now know as Cliff Lake. We found our campsite about twenty-five meters in from the rocky beach. After the tent went up, we hung the sleeping bags out for a bit of wind and sun therapy and also took the chance for our first real wash of the trip. Since it was mid-September the one thing we were not washing off was Muskol! 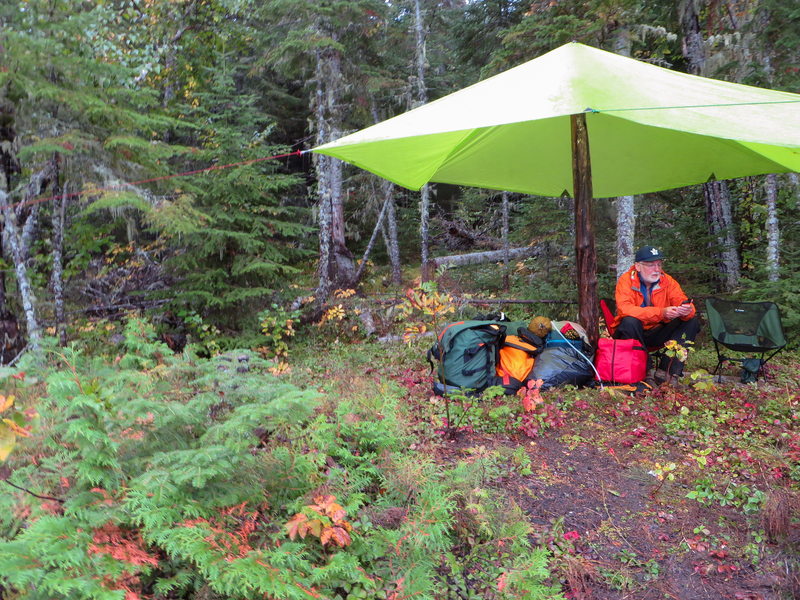 our tent spot on one of the Britannia Islands – 9 square meters of flat ground! Later on, we walked along the shore of the island and did a bit of bushwhacking to get to the other campsite on the south side. Above a cobblestone beach, we would find a clearing that would make a decent spot for a two-person tent. Given that the wind was still blowing fairly strong from the south we were happy with the flat and sheltered spot where we had put up our four-person tent. 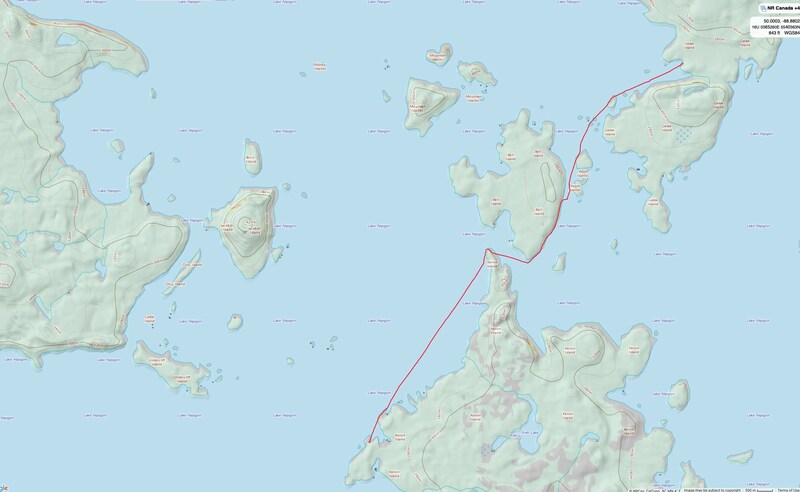 For the next few days, we would be making using of some of the following campsite locations as we paddled down the Lake to the south end of Kelvin Island before heading back to the mainland by Undercliff Island. time: 7:50 a.m to 4:15 p.m.
Once on the lake, we made twice-daily use of the weather forecast feature of our inReach Explorer +, the device we replaced our Spot Connect with last year. 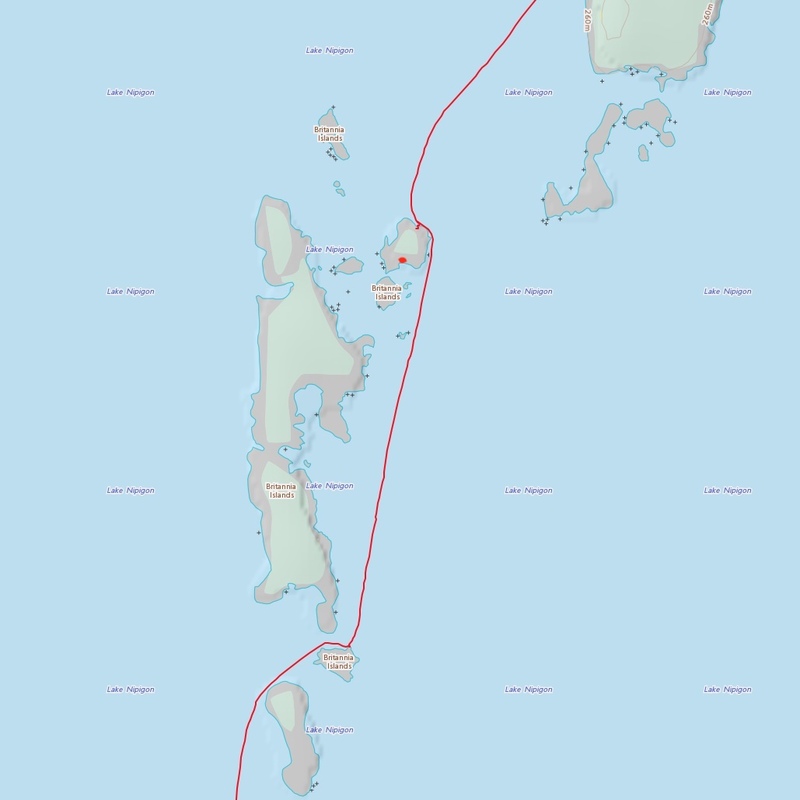 We found the forecast info to be accurate and helpful as we planned our southward track from island to island. On our first morning on the lake, we had a gentle SW wind to deal with and we had to work a bit in our three-hour 14-km. paddle to the SE tip of Hunt Island. That is where we got our first our first view of the Barn Islands with their distinctive shape. Over the next four days we’d be seeing them from all sorts of angles and finally, at the end of the Lake Nipigon segment of our trip, we’d be having lunch in a sandy beach cove on Inner Barn. The 5.3 km. from Hunt Island over to the Billings Island beach you see in the photo below? We did it in 45 minutes! The angle of the wind seemed just perfect. We had done 20 km. before our lunch stop. 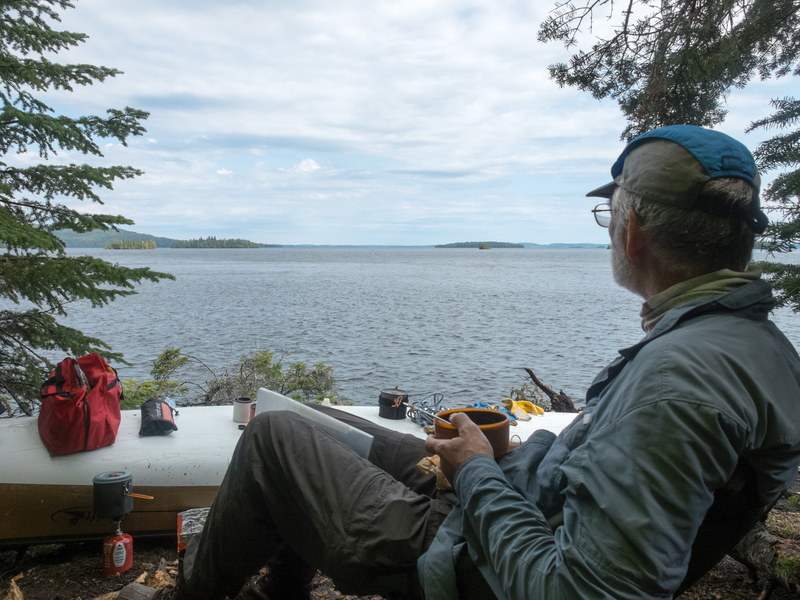 An hour or so later, fortified by more coffee and the usual lunch, we would mostly paddle along the west side of Billings and Geikie to a campsite indicated on the Lake Nipigon (North Section) map above. Had the wind from the SW or W been more pronounced, we would have headed over to the east side of Geikie and come down that way. One thing we did learn is that on Lake Nipigon the wind can come at you from four different directions on any given day! 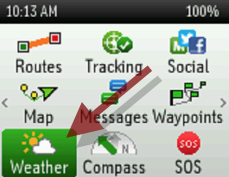 Our Garmin weather option usually had it right. We did not have any luck locating the campsite indicated on that map above! We paddled into the bay and scanned the shoreline but could see nothing resembling a possible campsite! We finally paddled out and into the bay to the north and, after checking out a spot on the north side, settled on the spot you see illustrated in the photos below. The spot was totally exposed but was fairly flat and the tall grass provided a bit of cushion. We didn’t know it at the time but this would be the last of the decent weather for a while. Day-time temperatures would plummet and things would get a bit wet in the days to come! But on this evening we enjoyed our front row seats as we sipped on whisky and snapped dozens of shots of the setting sun and its reflections on the water. In retrospect, the pix all look somewhat the same but it was a buzz while we were taking them! time: 9:35 a.m to 12:45 p.m. Moments after the tent was packed away it started to drizzle. Up went one of our tarps to cover the bags and the beginnings of our breakfast. We enjoyed a second mug of coffee while the rain persisted. A half-hour later we were looking at a blue sky and it was time to move on! 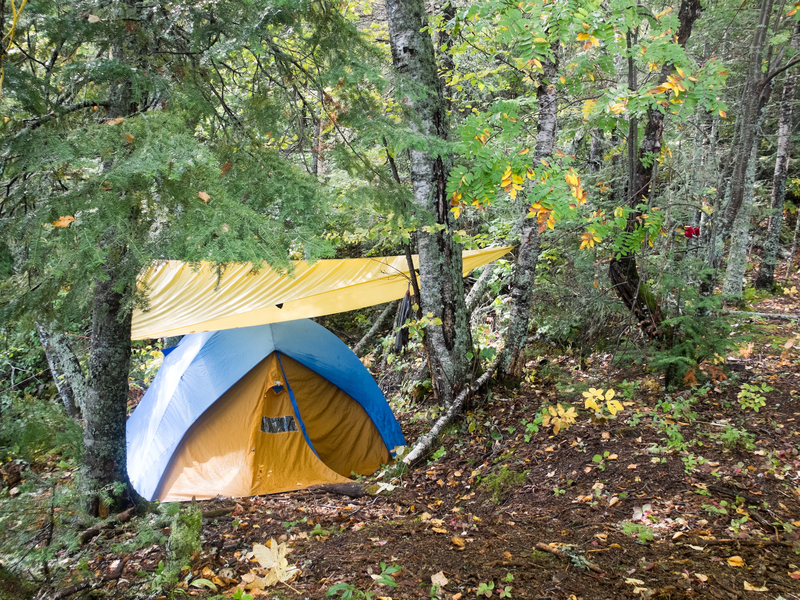 The image below captures our low-impact camping style! Our goal for the day was less ambitious than that of the day before when we had put in 34 km. over eight hours. 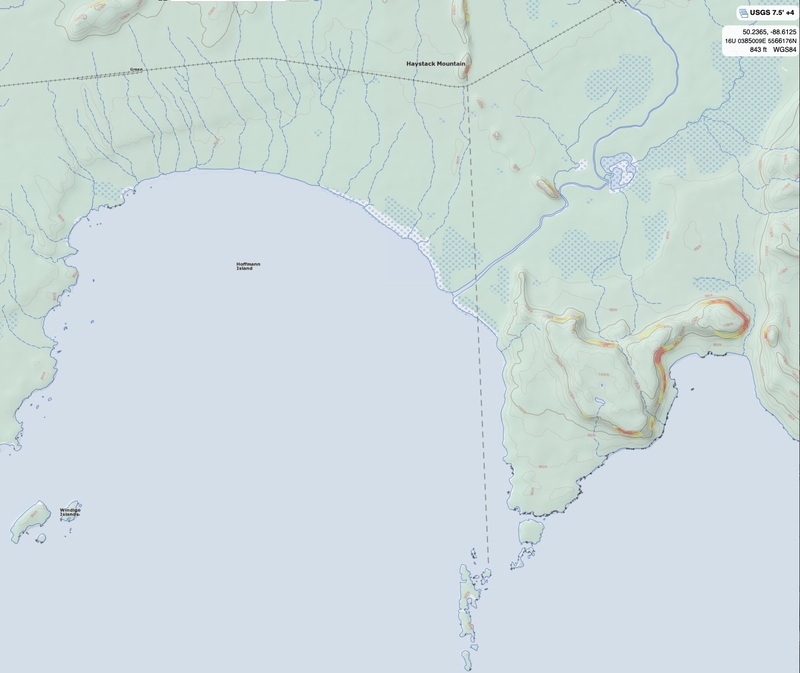 The Lake Nipigon Signature Site Map had a Kelvin Island campsite indicated in a small bay across from Undercliff island. It would make a perfect point from which to set off for Echo Rock the next morning, wind and weather permitting thanks to the five km. of open water between the two. 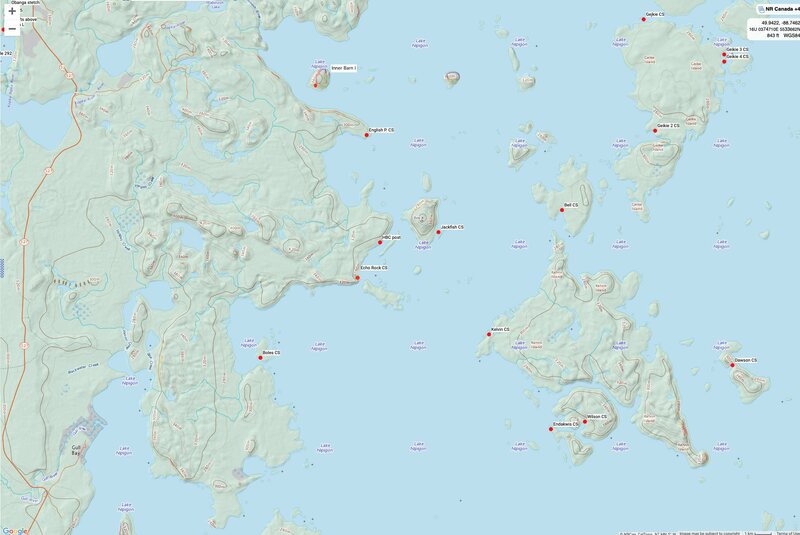 The wind was coming from the east/southeast but we hardly felt it as we paddled down the west side of Geikie Island. Going down the last two kilometers of Bell Island the wind and waves were pushing us into shore but soon we were paddling through the passage between Bell and Kelvin Island and heading south. As we rounded the northern tip of Kelvin Island and headed for the campsite we got our first glimpse of Echo Rock on the mainland. As the crow flies, it was only 12 km. from where we were when we took the photo below. The wind was no longer an issue and, as our track indicates, we felt comfortable enough with a straight line path to our destination. We found a campsite above the stretch of beach shown in the image below. Given that it faced north it got very little of the afternoon sun. There are actually three or four spots where it looks like people have camped. One had the remains of a plywood top fish cleaning table that hadn’t been used in a few years. 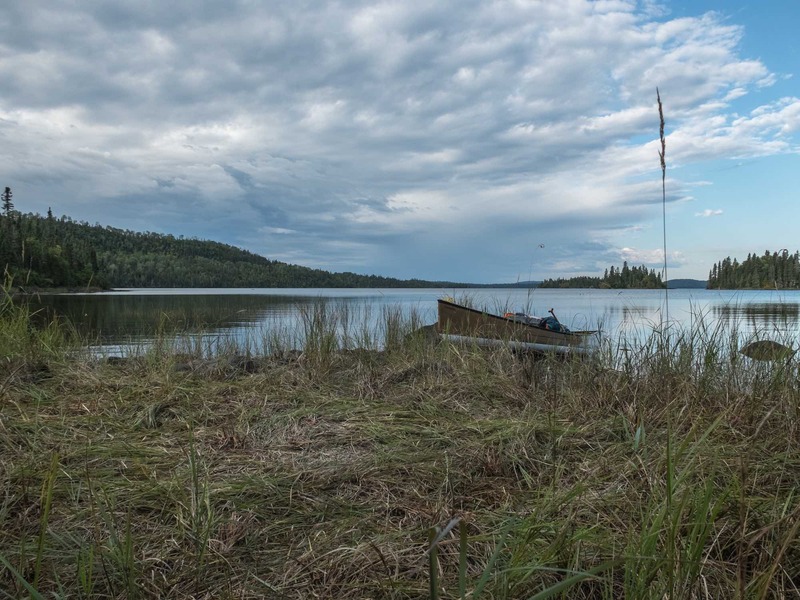 The beer cans and broken glass and tin cans were the kind of garbage you associate with motorboat fishermen and campers – perhaps visitors from Thunder Bay or perhaps locals from one of the First Nation communities like that of Gull Bay, some thirty km. away. 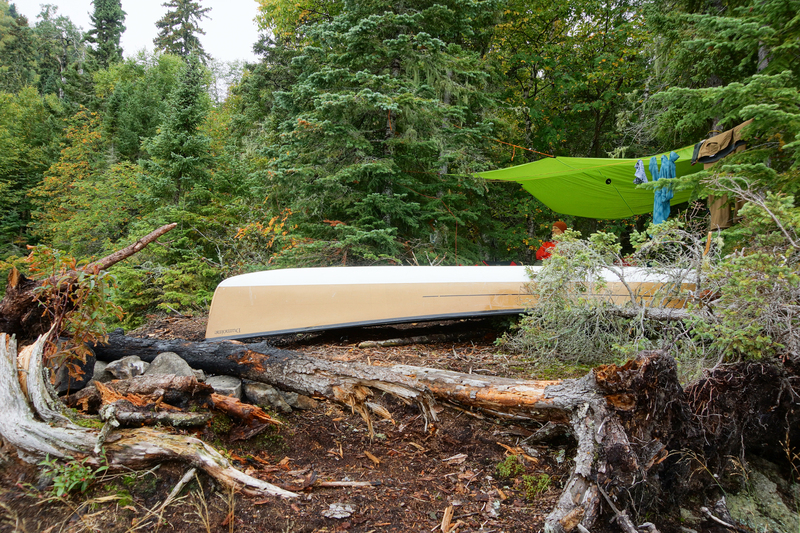 We left our shady campsite and went for a walk through the bush for a lakeside view of the next day’s paddle. I focussed on Echo Rock, partially hidden by the east end of Undercliff Island. By mid-afternoon, the wind had picked up some. We enjoyed our half-day of rest, having pulled in before 1 p.m.
Echo Rock is a part of the Undercliff Mountain massif. “The Gibraltar of the North” someone had called it and we knew we had to see it! A few years ago we had gone up to Bon Echo Provincial Park and spent a couple of days paddling alongside the awe-inspiring and pictograph-rich stretch of vertical rock known as Mazinaw Rock. [See The Pictographs of Mazinaw Rock: Listening For Algonquian Echoes.] Here we were at the other end (almost) of the Anishinaabe world with another dramatic Rock in our sights! time: 10:40 a.m to 12:40 p.m.
campsite: cove/point about 180m from Echo Rock; 1 x 4 person barely plus possible 2 x 2 person sites; hammocks possible. The previous day we had only paddled 18 km. It had been about 12:30 when we decided to stop at the designated campsite instead of putting in the extra hour to get to Echo Rock. Now, as we listened to the rain hitting the tarp we wondered if we had made the right call! Coulda, shoulda! For the second morning in a row, we waited out a rain shower. This time we waited almost two hours! Already the thought that we might be camping there a second night had crept into my mind. and then – around 10:30 the rain stopped! We loaded up and set off. Once away from the island we felt a mild E/SE wind blowing. It made our crossing that much easier and in less than an hour we paddled almost 6 km. to the eastern tip of Undercliff Island. The island provided a bit of shelter from the wind and the stretch of big open water paddling was done with. We headed for the west end of Undercliff I. and the Echo Rock face across from it. As we got close to Echo Rock another rain shower – this one lasted about a half-hour, just long enough to make any examination of the rock face for pictographs impossible. The channel between the island and the mainland also acted as a funnel for the SE wind. 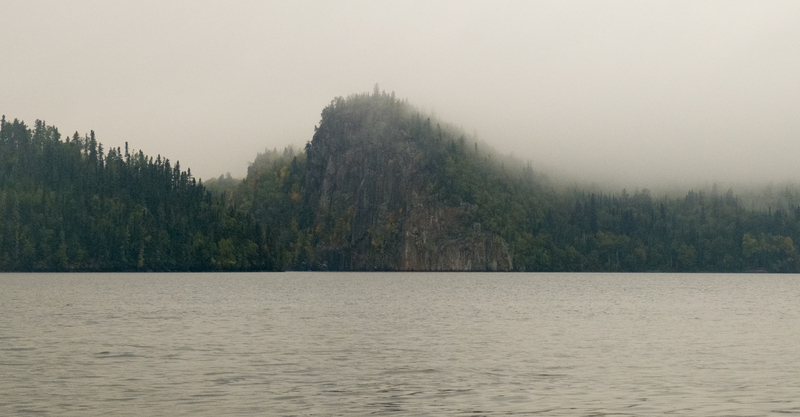 We got a peak of Echo Rock as we paddled toward where we thought the campsite was – i.e. on the inside of the small bay in the map image below. We were not seeing anything and ended up paddling along the bay to the north end before returning to the south end. There was the campsite we had somehow missed! The east-facing site is perhaps 150 – 200 meters from Echo Rock and sits about 10′ (3 m) above the water. There is some room up top for a couple of two-person tents. Our space-gobbling 4-person MEC Wanderer requires more than we could find up top so we set it up in a clearing below. The next morning we would get a closer look at Echo Rock. This time the wind was coming from the north and we’d have a bit of drizzle to contend with. Later we would learn that our time on the lake and up the west shore coincided with Hurricane Florence’s movement up the east coast. That might explain the unsettled weather and provide another reason for doing big lake tripping in July or August. Then again, in mid-September 2017 we spent a week in Georgian Bay’s French River delta enjoying weather that felt like mid-July! 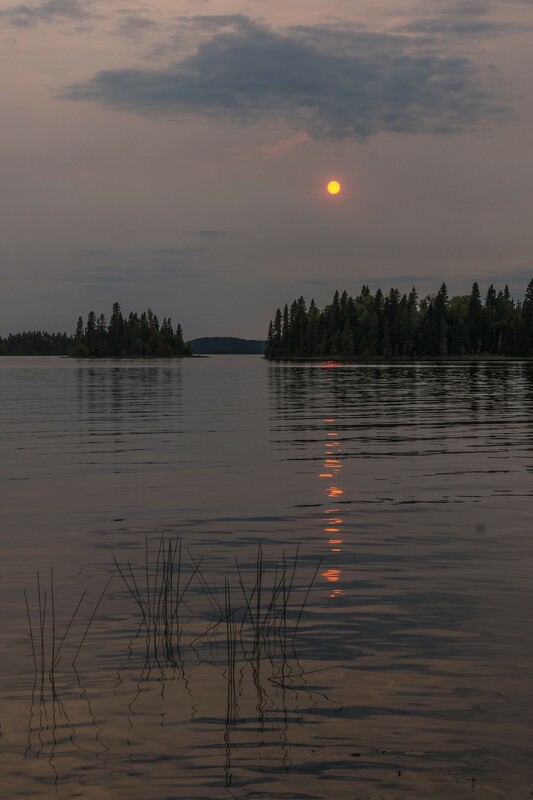 This entry was posted in Wabakimi, wilderness canoe tripping. Bookmark the permalink. or at my Bait Tackle and souvenir shop in Nipigon. The maps have also recently been updated and upgraded as well as ported to GPS Enabled Smartphone maps (to go live shortly).